It is time that our young Hispanics change the conversation. 2012 Hispanic Voice is a non-partisan initiative aimed to help Hispanics in America understand the responsibility of their voice and identity to cultivate sustainable economic prosperity in America. 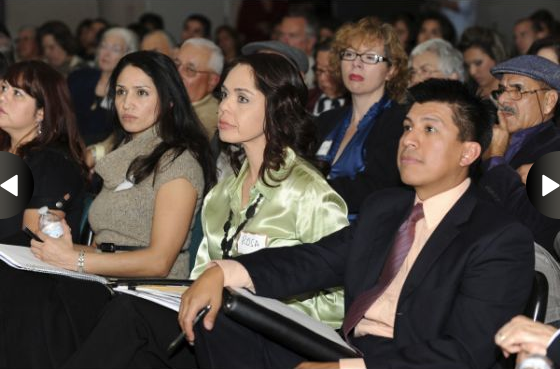 The 2012 Hispanic Voice Las Vegas Town Hall will be held at 4505 S Maryland Parkway (CBC A106), Las Vegas, NV 89154 on March 2nd from 6:30pm – 8:30pm. The 2012 Hispanic Voice Denver Town Hall will be held at University of Colorado Denver (Auraria Campus) - 900 Auraria Pkwy. Tivoli Turnhalle - Denver, CO 80207 on March 27th from 6:30pm – 8:30pm. Registration is free online at http://www.2012HispanicVoice.com. For more information on how you can host a Town Hall Tour event in your city and / or if you are interesting in being a volunteer, please contact us at: ideas(at)2012HispanicVoice(dot)com.